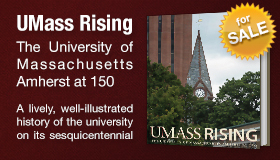 University of Massachusetts Amherst is celebrating the 150th anniversary of its founding as Massachusetts Agricultural College in 1863 following the passage of the federal Morrill Act. The year-long anniversary celebration will include a series of events for Founders' Week as well as, programs and activities highlighting important historical milestones, events and people. 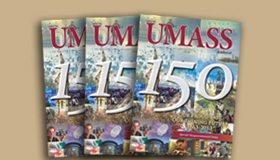 Please check back for additional Sesquicentennial event updates throughout the year. 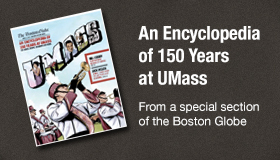 Join us as we celebrate UMass Amherst and 150 years of excellence. This symposium accompanies the exhibition Du Bois in Our Time, a landmark exhibition that focuses on the intersection of art and the major issues of our time, centered on the legacy of W.E.B. Du Bois and the causes he championed. 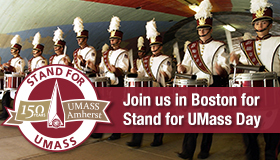 “Mass Impact” is a day where UMass students, faculty, staff, and alumni come together to serve the local community through volunteering at various project sites. Community needs are identified in advance and projects are established to address these needs. Opening reception for Du Bois in Our Time exhibition. Opening remarks by State Senator Stan Rosenberg. This program shows how community engagement can enhance your courses and research. It provides workshops and presentations for faculty, staff, students and community partners with practical advice on the best ways to incorporate community engagement into research, teaching, and service. Du Bois in Our Time is a landmark exhibition that focuses on the intersection of art and the major issues of our time, centered on the legacy of W.E.B. Du Bois and the causes he championed. The UMass Amherst Libraries hosts “Metamorphosis: Transformation from Agriculture College to University,” on the Lower Level and in Special Collections and University Archives, on Floor 25 of the W.E.B. Du Bois Library.